I’m getting a clearer picture of the forces at work that brought certain parts of my family together. Specifically the Folsom, Gilman, and Nason families, who moved around following opportunities in the skilled metal-working trade (making scythes and axes). The family of my 4x great-grandfather Charles Taylor Folsom was living in Waterville, Maine and he was listed as a “mechanic” in the 29 Aug 1850 census. Only two months later the same family was caught by the census-takers again after having moved to Fayette, Maine (which was the home town of Charles’s wife Elizabeth Judkins). There he and his son Charles Edward Folsom began working for the North Wayne Scythe Company and are listed as “Scythe Manufacturers” on the second census. 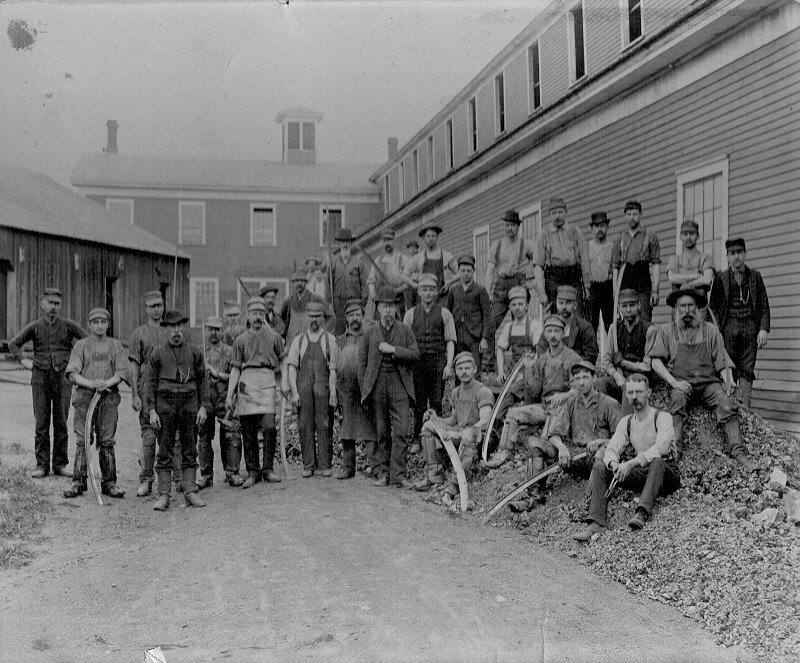 Scythe shop workers at the North Wayne factory. In 1857 the North Wayne Scythe Company burns down, so Charles T moved the family to New London, New Hampshire, part of which used to be named “Scytheville” because of the large scythe-manufacturing facility there. He and his son are again listed as “scythe manufactures” in the 1860 census for New London, working at the New London Scythe Company. “New London Scythe Company, 1871. Business offices, final polishing, painting, and shipping.” – Courtesy of the New London Town Archives. 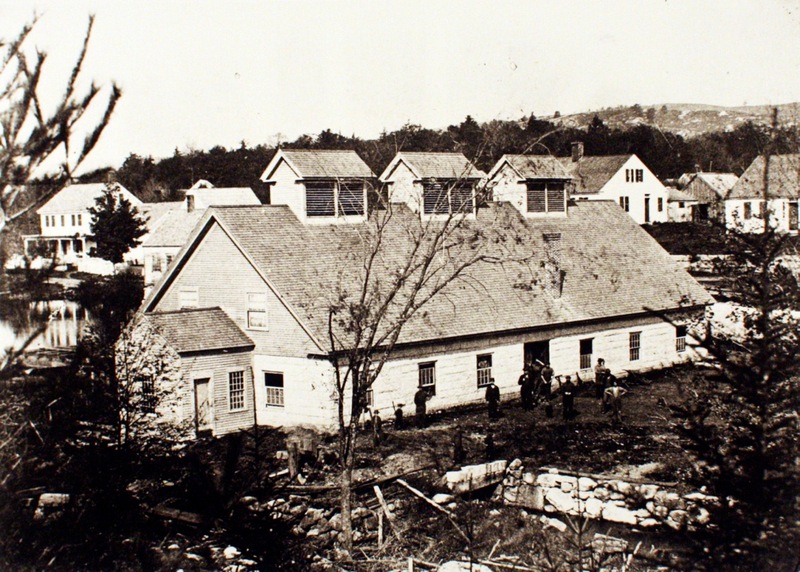 According to the New London Town Archives, Charles E. Folsom served as foreman of manufacturing and then became a partner by purchasing an $8,000 share of the business in 1869. 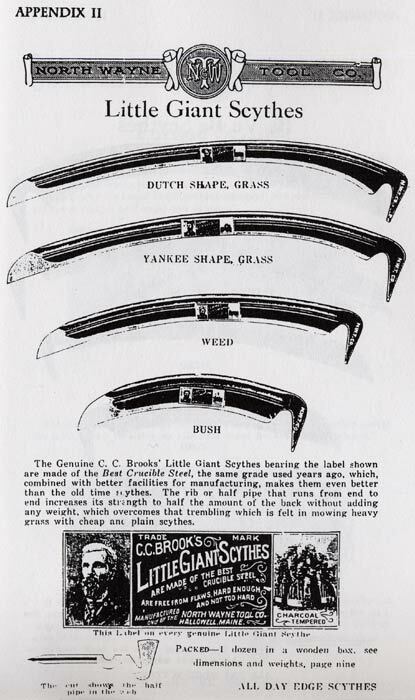 Unfortunately the scythe company went bankrupt in 1887, so the younger Charles left town and “went on to similar work in Winsted, Connecticut”. My 3x great-grandfather Ruel Nason was also born in Maine and also lived in Norridgewock, Maine. His father Uriah Nason was a farmer. Ruel then moved to Wayne, Maine, where he met and married Charles T. Folsom’s daughter Lucy Gilman Folsom about 1856. The couple was living next door to Charles E. Folsom in 1860. Ruel is listed as an “axe maker” and Charles E. Folsom as a “scythe maker” in that census. 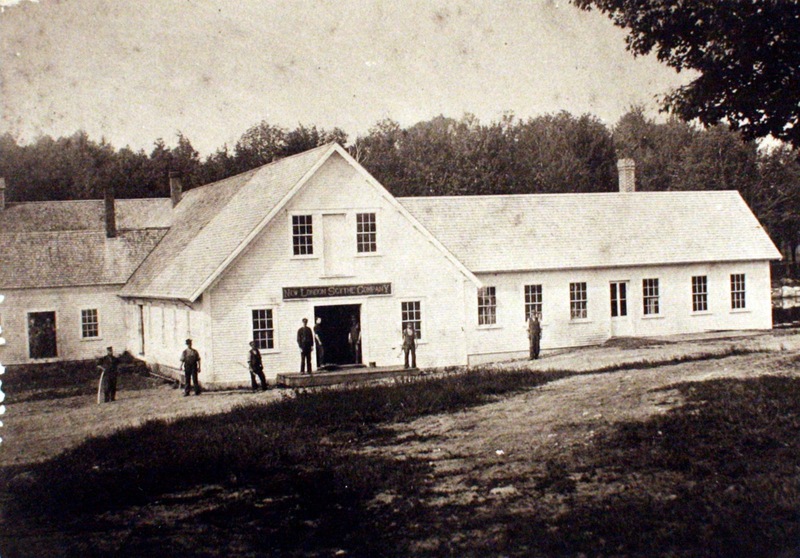 Ruel then moved to Skowhegan, Maine where he was working as an axe manufacturer in 1870. In 1881 he moved to Bedford, Canada and continued working in the same capacity. By 1886 he had moved back to Bedford, New Hampshire where he died in 1889 from pneumonia. Charles T. Folsom had died from pneumonia in 1886 in New London, New Hampshire. His wife died only three weeks before him, likely of pneumonia as well. The Gilman family also started off in Maine. Joseph Gilman married Florilla Folsom in Norridgewock, Maine in 1847. 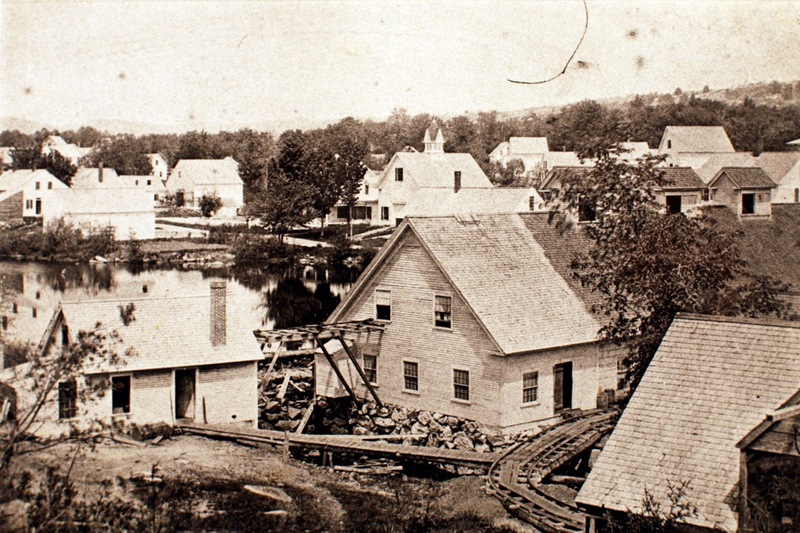 They then moved to Fayette and Waterville, Maine in 1850 where Joesph was working as a scythe manufacturer, a trade he continued after the family moved with the Folsoms to New London, New Hampshire according to the 1860 and 1870 census. Joseph’s sons Charles and Clarence Gilman are both living side-by-side in the 1880 census for New London, New Hampshire. Clarence is living with his mother, the widowed Florilla Folsom Gilman and her other son Fred Gilman. Charles T. Folsom, his wife Elizabeth Judkins, and brother-in-law Stephen Judkins are living nearby, as is Charles E. Folsom and his wife Mary Shackley. Charles Gilman is listed as a “scythe plater”. Charles T Folsom is a “scythe polisher”. Fred Gilman is listed as a “scythe plater”. Charles E Folsom is listed as a “scythe manufacturer”. In 1901 Charles Gilman went to Bedford, Canada (as Ruel Nason had in the 1880s) where he was working as an “axe manufacturer” in the 1901 census. His brother Clarence Gilman was in Highgate, Vermont plying the same trade at that point. Clarence then also went to Bedford, Canada and both Charles and Clarence were living together there and working as scythe manufacturers in 1911. 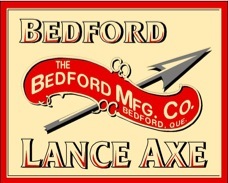 Bedford Axe Company, Bedford, Canada. So working through Maine, New Hampshire, and Canada, the three families lived near each other, married into each other, and worked in the metal-working trades together.